Federal and state agencies, and non-governmental organizations monitor many aspects of Rhode Island salt marsh conditions including area, location, abundance of fish and shellfish, species composition and abundance of vegetation, water level, and water quality. In 2016, the Narragansett Bay National Estuarine Research Reserve (NBNERR), the RI Coastal Resources Management Council (CRMC), and Save The Bay (STB) created a three-tiered approach to assess Rhode Island’s salt marshes. This monitoring is conducted either annually or on a 3-5 year cycle depending on the tier. Tier 1: This is a landscape scale assessment based on aerial flyovers where pictures are taken of Rhode Island’s coastal areas. 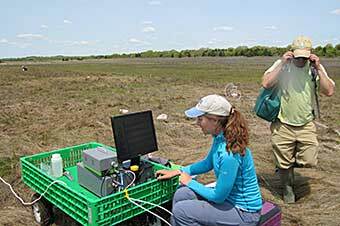 Then a Geographic Information System (GIS) is used to analyze the extent and habitat composition of salt marshes. Tier 2: This field-based, rapid assessment provides a quick look at a large number of salt marshes in greater detail. Rapid assessment looks at the marsh from the water’s edge to the upper marsh, characterizing the condition of individual salt marshes based on plant communities, human disturbances, and observable wetland response to disturbance. A Tier-2 metric is also being developed to assess a marsh’s potential for migration in light of future sea level rise. Tier 3: This intensive, research-based assessment includes in-depth studies at a subset of sites, which will provide more detailed insights as to how salt marshes function. These targeted sites are selected for focused study of the impact of accelerated sea-level rise, with a goal of maintaining long-term monitoring at a small number of sites that will provide additional insight regarding the impacts of climate change. 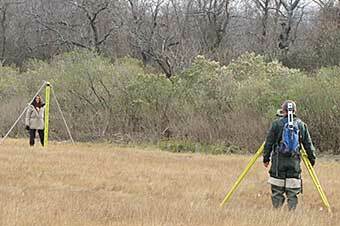 Currently, NBNERR and the US Fish and Wildlife Service, among others, conduct Tier-3 monitoring. Rose Martin monitors gas exchanges in Nag Marsh. Photo courtesy of Kenny Raposa, NBNERR Research Coordinator. NBNERR measures elevation at Coggeshall Marsh on Prudence Island. Photo courtesy of Kenny Raposa, NBNERR Research Coordinator. 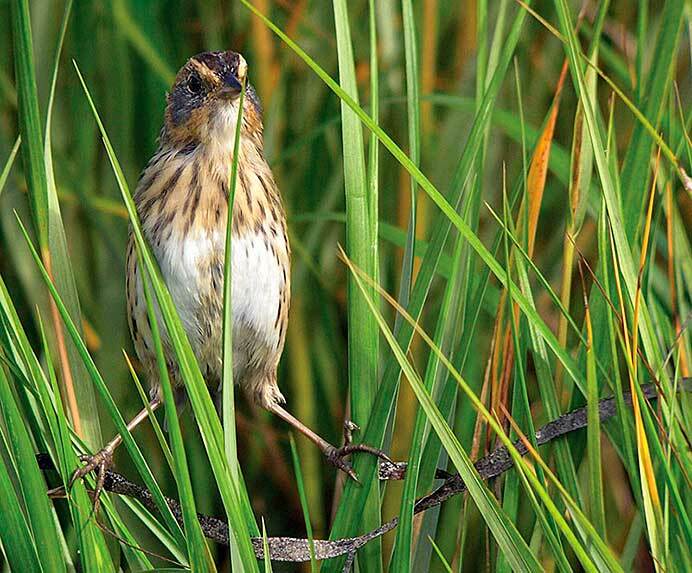 Saltmarsh sparrow: a species at high risk due to sea level rise. Photo courtesy of the US Fish and Wildlife Service. Many wildlife species thrive in Rhode Island’s salt marshes, but perhaps none depend on marshes so fundamentally as the saltmarsh sparrow. This species nests only in salt marshes on the Atlantic Coast from Maine to Maryland; consequently, threats to salt marshes are also threats to the saltmarsh sparrow. Sea level rise is a particular danger for sparrow nests, as this species tends to build their nests very close to the water’s surface and higher sea levels could increase the rate at which nests are washed away. The overall population numbers have dropped nearly 80 percent since 1998, a rate of decline that puts the saltmarsh sparrow on track for extinction in the next 50-80 years. The sparrow’s extreme vulnerability to accelerating rates of sea level rise makes it an indicator species—a “canary in the coal mine”—whose fate may indicate the future of salt marshes and the other wildlife species that depend on them. There is hope that ongoing projects to restore salt marsh habitats along the Atlantic Coast may increase nesting grounds and help improve the outlook for the saltmarsh sparrow.